One of the most popular landscape trees in the south the Live Oak is a massive and wide spreading, reaching up to 100 feet in width. 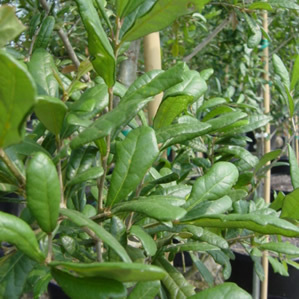 The foliage is semi-evergreen Many consider it an evergreen but the Live Oak does actually shead its leaves every year in the spring only it is growing new ones at the same time giving it the appearance of being evergreen. The bark is reddish brown fissured with gray. The leaves are leathery, shiny, dark green with soft, wool beneath. When Live Oaks are more juvenile in age their leaves resemble that of Ilex sp. with the spiny margins. The Live Oak bears acorns and is often draped with Spanish moss in the wetter eastern portion of the country. Through much hybridization Live Oaks further West tend to withstand more heat and drought while Live Oaks in the East can actually grow in occasional standing water. Reaching up to 40-80 feet in height it is also a Texas Native.